This lesson is focused on interpreting the results of actions provided by SoftEdge. Of the five dashboard views available only Messages Sent, Page Views, and Conversion Rate provide useful graphics. The Summary Stats stay consistent no matter the dashboard selected. 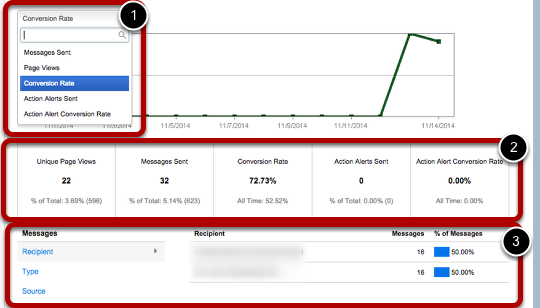 Message Stats give a deeper segmentation of action results. Type; type of email email, letter, phone, etc.